SAL DeTRAGLIA'S VIRTUAL TAPAS BAR: FROM AMERICA’S DAIRLYLAND...THE ORIGINAL COW PIE! 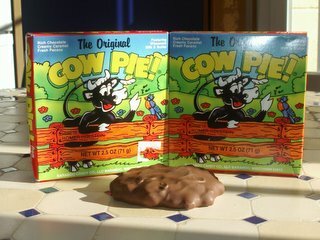 The Original Cow Pie is Wisconsin’s finest export since “Laverne and Shirley.” It’s a heavy-duty hunka mind-blowing confection—and one that I don’t recommend eating within an hour of jogging (which, unfortunately, is exactly what I did this morning). In other words, it’s like a candy Turtle on steriods. And man-oh-man! Is it GOOD! Yep...in India, they cook on cow pies. In Wisconsin (and now, Spain), they eat them. Gracias, Lisa! I don’t think I’ll need any Conguitos this week. Sal, So glad we did your little candy swap this year. Are you sharing them with the family...or are you doing what I did with the Conguitos...hiding them for your own guilty pleasure. I won't tell if you don't. Oh...let's just say that there's no need to hide or share them anymore. WOW i haven't had these since I wento Michigan...Yes they are pretty darn good! I wish they had them here in California! WHAAA!!! That name reminds me of this chicken shack we had back in my neighborhood in Philly.... Cluck-U-Chicken. We have that here too. I havent been there in years! One of my old law school classmates told me there's a famous liquor store in Beaver, PA. You can probably figure out the rest on your own. PS: I doubt it's true, since PA only sells booze in state-run stores. Still, it was a clever urban legend. A friend of mine living in Texas sent me some of those cow pies for Christmas. We don't have anything similar to that in Belgium. OH MY GOD they are sooooo scrumptious!!!!! Forget about Cow Pies. Did you take those photos on your blog?! You, my friend, are going straight to my sidebar. AND NOW FOR A VTB POLL. HE REAPPEARS IN A PUFF OF SMOKE. YOUR 2005 VTB CHRISTMAS POEM. A POST FOR POSTERITY: NONNIE’S PUSTY RECIPE.